Growing up I’d turn away from the hefty strawberry cheesecake and other ginormous desserts crowding the rotating display cases you’d find at the ubiquitous Greek diners on Long Island. To me there was just something not right about those cakes, something unappetizing in their appearance. 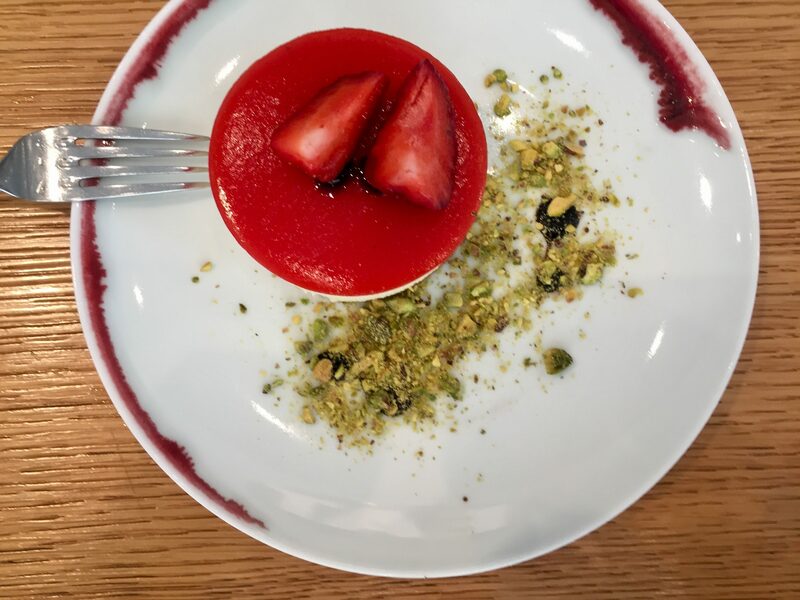 The diners weren’t alone in super-sizing, many a restaurant served that cheesecake, it’s strawberries suspended in gelatin dosed with FDA approved food dye — besides being big, those were very unnaturally red looking strawberries. Really, I’ve been averse to them ever since, that is, until a recent visit to Untitled at the Whitney, Danny Meyer’s, Union Square Hospitality Group restaurant that sidles up against the Whitney Museum of Art. Untitled’s version takes a contemporary spin that foregoes size in favor of flavor and texture. In it there’s a confluence of events going on: a lightness and tang to the cheesecake, a buttery crunch to the sablé cookie it rests upon, a salty chew to the pistachio crumble it is partnered with and, a tarty edge owing to a smattering of aged balsamic vinegar. All of these taste and texture plays work work well with the locally sourced realistically red strawberries happily nesting in a layer of strawberry puree — there’s nothing here reminiscent of the cheesecake of my Long Island days of yore and, visually, this is, in its own small way, a delicious tasting work of art.